Discover definitive recordings of classical music with your trusted guide Rob Cowan. 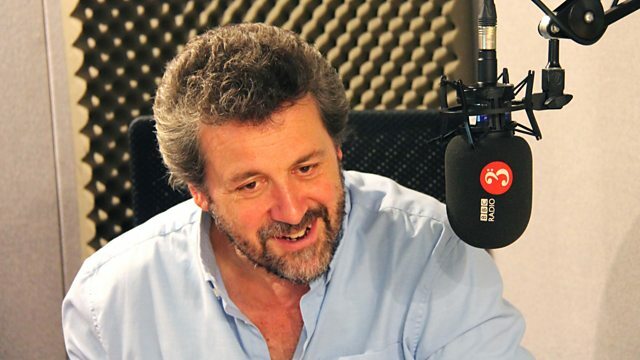 His guest is theatre and film director Dominic Dromgoole. Rob's guest this week is the theatre and film director Dominic Dromgoole. Dominic was the Artistic Director of Shakespeare's Globe on London's Southbank for 10 years from 2006 to 2016. He grew up in a theatrical household; his mother was an actress, his father a director, and he'd formed his first theatre company by the age of 16. Dominic held positions at theatres in London and Oxford before taking the helm at Shakespeare's Globe where he built on the work of his predecessor, Mark Rylance, by emphasising his love of new writing and expanding the possibilities of the Globe; between 2014 and 2016 he took a production of Shakespeare's Hamlet to 197 countries. Despite Dominic's commitment to Shakespeare, he's renowned for nurturing contemporary talent; 65 new plays were premiered during his tenure at the Bush Theatre in London. As well as discussing his work as a director, Dominic shares his passion for classical music, choosing a selection of his favourite works. This week Rob explores music connected with Budapest, today focusing on a suite that György Ligeti wrote whilst studying at the city's Ferenc Liszt Academy of Music. Ligeti had become involved in cultivating a national heritage by writing a suite on 19th-century Hungarian dance melodies. Rob explores the nature of performance by highlighting the differences between two interpretations of Liszt's Consolation No 3 in D flat major by pianists Grace Francis and Jorge Bolet. Rob's Proms Artist of the Week is the Russian violinist Alina Ibragimova. Ibragimova is one of the world's leading violinists, excelling in a wide range of repertoire and as both a soloist and chamber player. Born in 1985, she studied at the Moscow Gnesin School before moving to the UK where she studied at the Yehudi Menuhin School and Royal College of Music. So far in her career, Ibragimova has performed with orchestras such as the London Symphony Orchestra, Cleveland Orchestra, Deutsche Kammerphilharmonie Bremen, Finnish Radio Symphony, Orchestra of the Age of Enlightenment, and with leading conductors including Valery Gergiev, Sir Mark Elder and Gianandrea Noseda. She's also worked as a soloist-director touring with groups such as the Britten Sinfonia, Academy of Ancient Music, and the Australian Chamber Orchestra. Ibragimova is also a member of the Chiaroscuro Quartet and has a regular recital partner in pianist Cédric Tiberghien. Tomorrow (6th September) she performs Prokofiev's First Violin Concerto at the BBC Proms with the London Philharmonic Orchestra and Vladimir Jurowski as part of a Russian-themed programme. Throughout the week Rob will be showcasing her wealth of recordings, from solo Bach, to Prokofiev's Second Sonata, Schubert's Fantasy in C major, D.934, and concertos by Karl Amadeus Hartmann and Mendelssohn. Bizet, Ravel, Faure: Katia & Marielle Labeque. Performer: Annie Lydford. Choir: Choir of Gonville & Caius College, Cambridge. Conductor: Geoffrey Webber. Choir: Choir of Gonville & Caius College, Cambridge. Conductor: Geoffrey Webber. Singer: Anne Sofie von Otter. Performer: Jakob Lindberg. Performer: Anders Ericson. Orchestrator: Leopold Stokowski. Orchestra: Bournemouth Symphony Orchestra. Conductor: José Serebrier. Music Arranger: Bjarte Eike. Ensemble: Barokksolistene. Director: Bjarte Eike. Singer: Greta Bradman. Orchestra: English Chamber Orchestra. Conductor: Richard Bonynge. Ensemble: Asko Ensemble. Ensemble: Schoenberg Ensemble. Conductor: Reinbert de Leeuw. Performer: Alina Ibragimova. Performer: Steven Osborne.